How will the digital marketing plan workbook help me and my business? It can be difficult to know where to start when creating or updating your digital strategy. Use our workbook and you won't have to start with a blank page. Instead, this workbook gives you a tried-and-tested structure based on the Smart Insights RACE Planning framework. 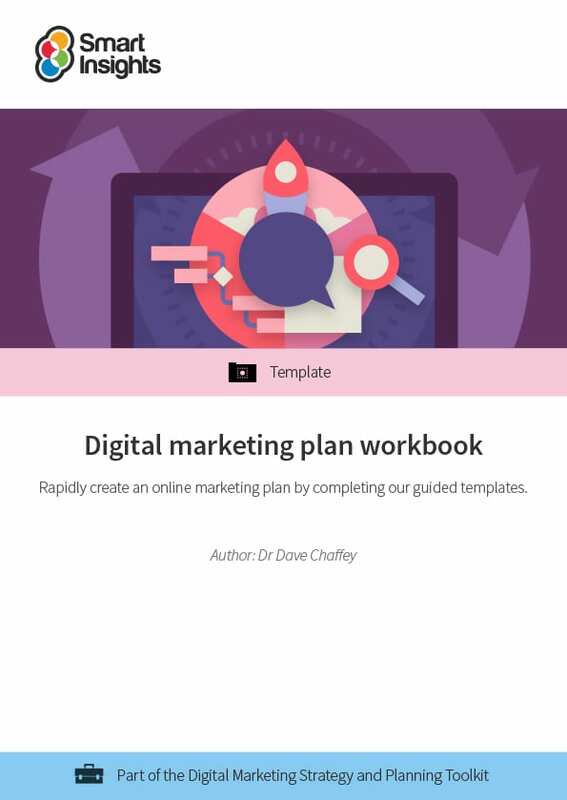 Our digital plan workbook is designed to help you define a digital marketing strategy as quickly as practical by filling in blank templates in Word format. If you're looking to present your audit and strategy recommendations to colleagues or clients, see our Digital marketing strategy Powerpoint template. The template tools in the workbook are tables and charts designed for quick analysis and summary of current use of digital marketing and future digital strategies to improve the contribution of digital marketing in the future. We have selected 5 core templates that are essential for a plan in a business of any size. For a more detailed strategic analysis and definition for larger businesses, other optional templates are available. How is the digital plan workbook structured? This workbook will guide you through a three-step process to create and implement a digital marketing strategy. If you’re short on time there are five essential templates to complete, including a one-page summary, with more detailed templates for each part of RACE Planning – which is broken down into 25 key digital marketing activities, one for each part of RACE. First the templates help you review the opportunity from the digital marketplace by reviewing customer and competitor use of digital technology and Paid-Owned-Earned media. You will then summarise the opportunities and corresponding strategies in a TOWS matrix and review the current digital marketing capabilities of the business. A template then enables you to define SMART objectives based on your analytics and market insights to form a digital dashboard that will be reviewed at the action stage. The strategy defines which digital marketing activities you will prioritise to compete. It summarises where you will focus your resources and investment to hit your targets. Example online marketing plan – download a worked example of applying the strategy tools for a B2C company. Powerpoint digital marketing plan template – an alternative template if you need to present your strategy to colleagues or clients in Powerpoint. Includes visuals and infographics to improve the credibility of your presentation. RACE Digital Marketing Qualification – the first unit in this online training course explains each part of the 25 key digital marketing activities forming the RACE planning process. Dave is co-founder and content editor of Smart Insights. He is editor of the 100+ templates, ebooks and courses in the digital marketing resource library created by our team of 25+ Digital Marketing experts. Our resources used by our members in more than 100 countries to Plan, Manage and Optimize their digital marketing. For my full profile, or to connect on LinkedIn or other social networks, see the About Dave Chaffey profile page on Smart Insights. Dave is author of 5 bestselling books on digital marketing including Digital Marketing Excellence and Digital Marketing: Strategy, Implementation and Practice. In 2004 he was recognised by the Chartered Institute of Marketing as one of 50 marketing ‘gurus’ worldwide who have helped shape the future of marketing. Individual and Business members get full access to this and 16 other guides in the Digital marketing strategy and planning Toolkit.